Ouachita Electric has launched a program which offers further proof that being a member of an electric cooperative has its advantages. 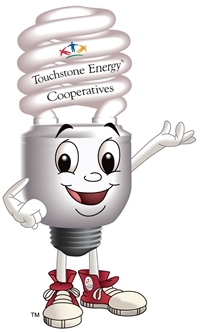 CFL Charlie, Touchstone Energy® Cooperatives’ energy efficiency mascot, is ready to head into classrooms this fall and help educate kids about co-ops, energy efficiency, renewable energy and electric safety. The Super Energy Saving Kid Classroom Kits, designed for grades 1 – 5, are packed with materials that will teach kids how to become "Super Energy Savers" at home, such as take-home checklists that walks kids and parents through their homes identifying energy-saving practices; Super Energy Saver certificates signed by CFL Charlie; activity sheets and folders, and CFL Charlie switch plate covers that remind kids to turn off lights when not in use. Ouachita Electric is implementing this program in conjunction with many other Touchstone Energy cooperatives, in an effort to better serve our member-owners nationwide. Touchstone Energy is a national alliance of local, consumer-owned electric cooperatives providing high standards of service to customers large and small. More than 670 Touchstone Energy cooperatives in 46 states are delivering energy and energy solutions to approximately 22 million customers every day. Touchstone Energy cooperatives serve their members with integrity, accountability, innovation and longstanding commitment to communities.